LYONS (nee Turley) (Jerrettspass) died 7th February 2019 peacefully at Craigavon Area Hospital Ita R.I.P. wife of the late Seamus and much loved mother of Gary and Rowan and dear sister of Phil, Jim, Pauline, Vincent and the late Patsy, Danny, Margaret, and Vera.Late of 14 Rock Road. Her remains are reposing at the home of her son Gary 9 Carrickrovaddy Road, Jerrettspass. Removal on Sunday at 1:15pm for 2:00pm funeral Mass in St Mary's Church Barr. Interment afterwards in St Colman's cemetery Shinn. Deeply regretted by her sorrowing sons, grandchildren, daughters in law, brothers, sister, nephews, nieces, cousins, family circle and friends. 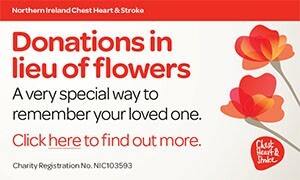 Family flowers only Donations in lieu if desired to Chest Heart & Stroke Association C/o the family or Charles Digney & sons funeral directors, 4 Sugar House Quay, Newry. I am sorry to tell you that Ita Lyons has passed away.